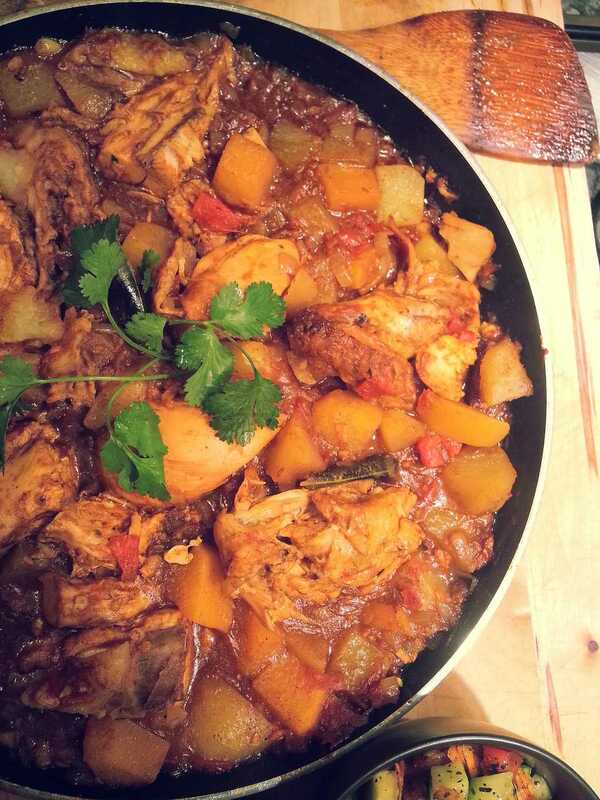 This simple Durban chicken curry recipe is the perfect introduction to South African Indian cuisine. I feel very fortunate to have grown up in Botswana, which is the country directly north of South Africa. Although it is a relatively small country, I was still able to experience diverse cultures within my community. One of these was the South African Indian culture, as many of my Indian friends that I grew up with actually identified themselves as purely South African and called Durban home. Birthday parties and events were the best things to attend as this is where I got exposed to flavors I still feel nostalgic about. Hot curries and ​samosas were an absolute favorite. Try this simple recipe I have created inspired by these memories. It may look like a long list of ingredients, however, many of these are common spices, or items that you can easily find at any grocery store. In a heavy based pan, melt the butter in the vegetable oil, then add the spices to temper and become fragrant. Be careful not to sear or burn the spices, but allow the gentle heat to do its work for about a minute. Add the onions, garlic and ginger and fry until softened. This should take about 3 minutes on a medium heat. Turn the heat up to high and add the chicken pieces. Chicken on the bone such a thighs, drumsticks or wings work best with this recipe as the bones enrich the flavor and the chicken remains moist. Allow the meat to brown and coat the pieces in the onions and spices very well. After about 5 minutes, add the tomato puree and chopped tomatoes and give the pot a good stir. Throw in the diced potatoes, swede, chicken stock, and curry leaves. Check for seasoning as it may require a pinch or two of salt at this stage if necessary, then allow to simmer for about 30 minutes on a low to medium heat. *Care should be taken to ensure there is enough heat to cook to potatoes through. You will notice they absorb much of the water and become fluffy when ready. When ready, garnish with the fresh coriander leaves and serve on a bed of basmati rice and a sambal on the side.